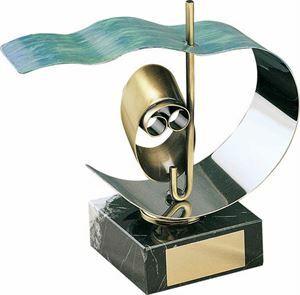 This attractive award has been designed and made in Spain by skilled craftsmen from quality products. The trophy is made of premium metal and features a curved, wavy piece of metal, finished with a sea green glaze. A gold scuba diving mask is positioned underneath this blue metal with a snorkel puncturing the surface. The Scuba Diving Handmade Metal Trophy is mounted on a black marble block and comes in 3 size options. Supplied with a FREE engraved self adhesive plate, the Scuba Diving Handmade Metal Trophy comes in a range of 3 size options. Handmade by master craftsmen in Barcelona, the trophy features a scuba diving mask and snorkel set under a wavy blue water effect surface.